Remember that wonderful shockingly Muppet-licious letter I blogged about recently? In it I mentioned some fabulous postcards he sent me, so I now share with you that bounty. 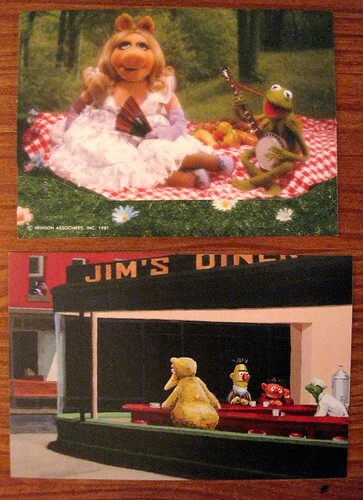 At the top is a Muppet postalette, a fold-and-mail sort of Hallmark wonder, here celebrating Kermit and Piggy's picnic love. Below is a really incredible parody, which we must see a little bit closer. 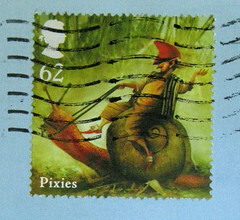 My generous blog reader correspondent sent me a few of these, so I've got a mini-collection of 'em. Those familiar with basic American Art History 101 will recognize this as a very witty parody Edward Hopper's famous painting, "Nighthawks." 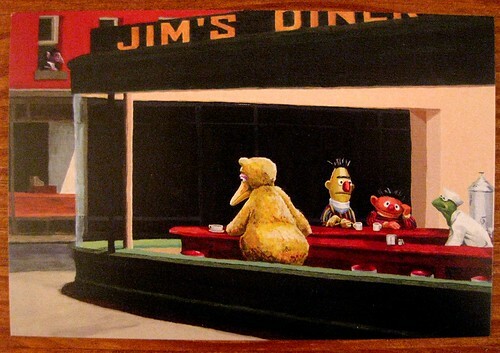 My generous sender said he found the Muppet parody online, and did not know the artist but had a whole bunch of the postcards printed because he loved them. Hear, hear! If anyone recognizes the artist, I will happily credit him or her. For now, though, let's admire the fun detail. See The Count up in the upper lefthand corner? Fabulous! I should note that these are Sesame Street Muppets, not Muppet Show Muppets. There is a difference. My generous sender is more a devotee of the Sesame Street variety, and I am strongly in the Muppet Show camp, but we are different branches of the same tree and I still admire all the Jim Henson creations. Okay well did nt night hawks have like marilyn monroe , elvis presley , bogart and sinatra ? something like those . seems I remember something like that . Oh well love the muppets too . I love the Hopper parody. I vaguely recall seeing Miss Piggy in a Christina's World (Andrew Wyeth) parody but can't find anything online. It might have been a one-off.